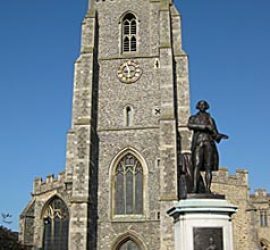 St. Peter’s and Gainsborough’s Statue are situated in the centre of Sudbury. St. Peter’s is a redundant church which is used throughout the year to put on entertainment such as a venue for concerts, exhibitions, farmers and craft markets. On the north side of the church is a fountain and horse trough which is mentioned in Dodie Smith’s 101 Dalmatians. On the Market Hill is a statue of Thomas Gainsborough which was unveiled in 1913.